Quest Vitamin D3 provides 2500iu of vitamin D per tablet supporting the immune system, bone health, teeth and muscles. 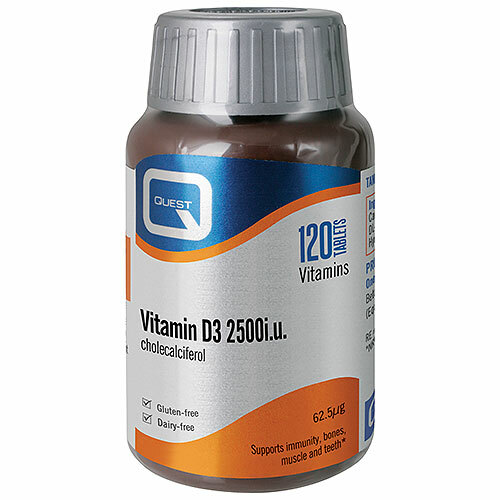 Quest Vitamin D3 provides 2500iu of vitamin D per tablet. Vitamin D contributes to the normal function of the immune system and muscles. It is needed for the utilisation of calcium in the body and helps to maintain bones and teeth. Vitamin D is naturally created by the body through exposure to sunlight, and may be recommended as a supplement for individuals with limited exposure to sunlight. Dicalcium Phosphate, Microcrystalline Cellulose, Vitamin D3 (with Arabic gum, antioxidant: dl-a-tocopherol, tri-calcium phosphate), Magnesium Stearate, Anti-caking Agent: Silicon Dioxide. As a food supplement take one tablet daily with food. Swallow with water. Below are reviews of Vitamin D3 - 2500iu - Cholecalciferol - 120 Tablets by bodykind customers. If you have tried this product we'd love to hear what you think so please leave a review.